The Victorian Government has announced a new program to help victims of domestic violence. “Pets are an integral part of families and we know that women and children are making decisions not to flee violence because they are concerned about the future and welfare of their pet,” said Families and Children Minister Jenny Mikakos, at the launch. The Government said it would provide $100,000 over the next four years and Safe Steps would work with animal welfare agencies like the RSPCA to implement the program. The additional funding will lift capacity to house pets at risk while their family members go to shelters to escape abuse. Until now, there has been a smaller volunteer network to take in pets in foster homes. The connection between family violence and violence against animals is well documented. Pets in abusive homes are often targeted and threatened and so women living in abusive situations often do not escape for fear that their animals will be harmed. I’m very proud of my home state of Massachusetts. 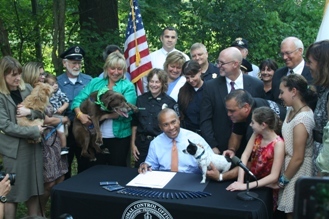 Last week, Governor Patrick signed bill S. 2192 “An Act Further Regulating Animal Control” into law. Creates a statewide spay/neuter program to reduce the number of homeless animals and will, in turn, also reduce the cost to cities and towns for housing and sheltering these animals. This is funded by a voluntary tax check off. Adds enforcement provisions to section 139A (the spay/neuter deposit law for animals adopted from shelters and animal control facilities) to ensure homeless animals can’t reproduce. Requires animal control officers to receive training. This is funded by the tax check off. 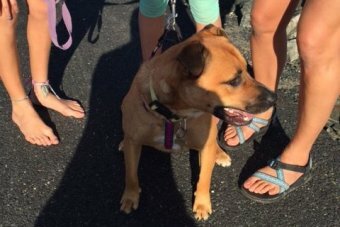 The law will also create some statewide oversight for animal control, which previously did not exist in the state; creates categories for kennel licensing; creates consistency in the holding time for stray dogs and provide other meaningful updates to the state’s antiquated animal control laws. An amendment to the bill also added some restrictions on the tethering of dogs. This new law will not cost money, it will actually minimize costs to cities and towns by reducing the number of homeless animals and the associated cost to house and take care of them. In addition, ensuring that animal control officers are trained, and improving the dangerous dog law to protect public safety, will provide indirect cost savings. Best of all, this bill proves that animal welfare agencies can work together. The bill was drafted as a collaboration between the Animal Control Officers Association of Massachusetts (ACOAM), the Massachusetts Society for the Prevention of Cruelty to Animals (MSPCA), the Animal Rescue League of Boston, the state’s Bureau of Animal Health within the Department of Agricultural Resources and the Massachusetts Veterinary Medical Association (MVMA).